As mobile video apps get increasingly sophisticated, people don’t just want to record video clips on their iPhone: they want full-on cinematic productions complete with special effects, transitions, stop motion, timelapse and image stabilization. With the new Hyperlapse video app, which hit Apple’s App Store this morning, Instagram combines timelapse effects reminiscent of those built into the iPhone 5s with stabilized motion tracking present in apps like Stupeflix’s Steady and others for a simple, phone-based production workflow. Those words sound more complex than the Hyperlapse procedure used to accomplish it. Instagram has two aims with Hyperlapse: the timelapse video that has become all the rage, and steady, stabilized motion tracking that often makes amateur videos look much better than they deserve to. Both are built into the Hyperlapse algorithm, which uses the phone’s gyroscope to track camera movement and compensate for the jerky shifting motion that characterizes most handheld video. I took Hyperlapse down the street and discovered a few things about how it works. Ease of use is the operative point of entry for consumer photo and video apps, and Hyperlapse wins the Easy App of the Year award for that. You just launch the app and get started. 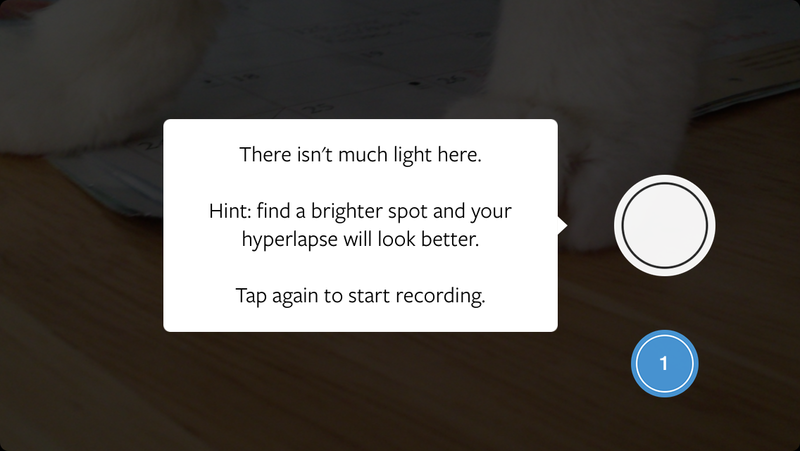 There are a few prompts: like many people with a new app, your first subject will be inside your home, but Hyperlapse alerts you if your environment is too dark to produce a good video. And like any good app, it gets out of the way if you want your video dark. 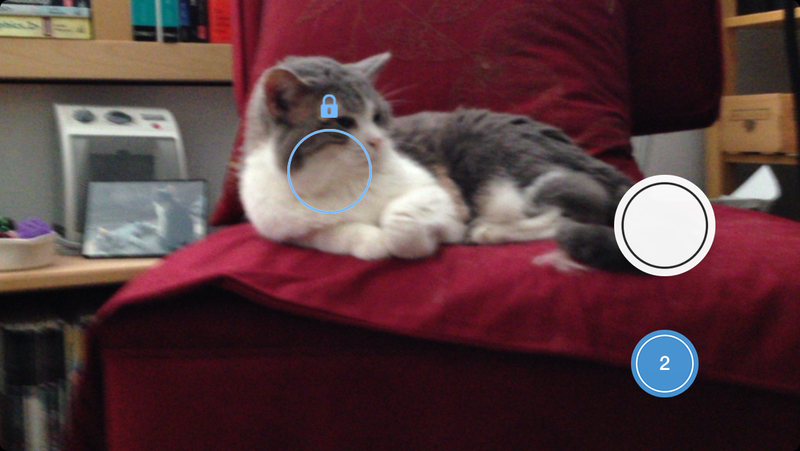 I found the video that Hyperlapse thought too dark to be just fine for my purposes — like filming the cats, for example. There’s nothing to set up beforehand except your location, and you can tap to adjust the exposure and focus directly on the iPhone screen at the start and throughout your shoot as you change environments and adapt to shifting lighting conditions. The effect is immediately viewable without any other cues. A tap and hold will lock that setting. Tap and hold to lock exposure and focus. The blue badge tells me I have two new videos waiting in the queue. 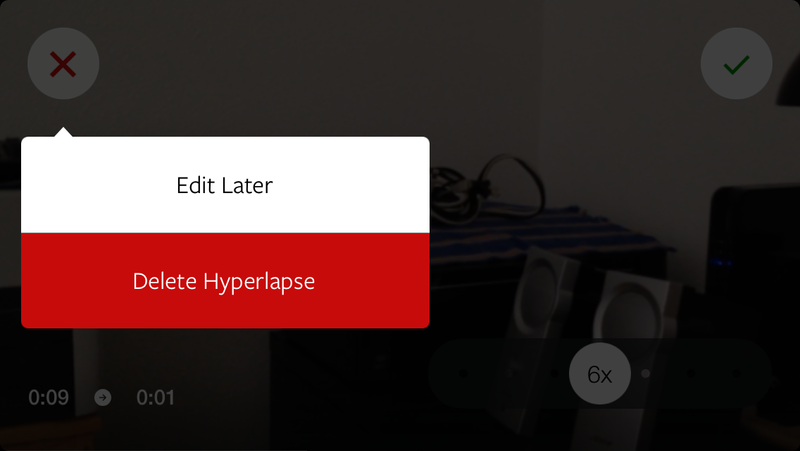 Hyperlapse automatically records at 6X regardless of how you set your previous video. This makes sense, because all videos must be at least three seconds long and recording at 6X gives you an accurate way to shoot the shortest video possible with the app. As you shoot, you’ll see a timer on the left showing how long your recording is and a timer on the right showing how long the video will actually be. After you finish recording (up to 10 minutes with an iPhone 4; up to 45 minutes with an iPhone 5), you can choose to accept or reject the video you just shot or save it for later. Saving for later gives you a numbered badge so you know how many videos you have. It’s nice that if you’re shooting a series of videos, you don’t have to make up your mind immediately about which ones you want to save and can go back to them at any time. 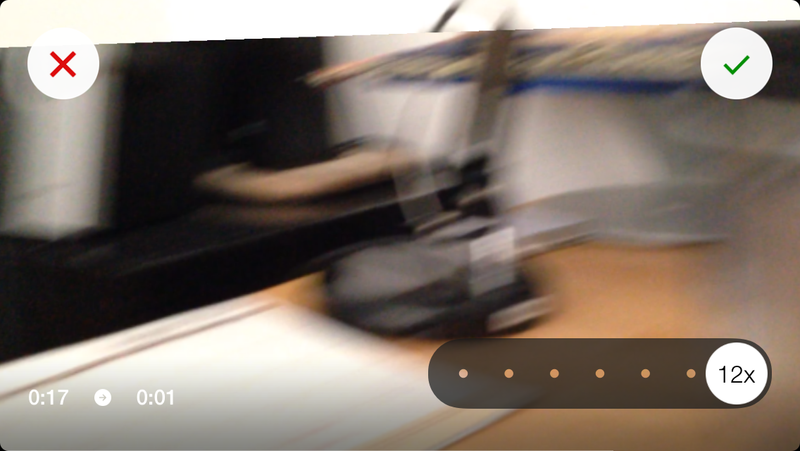 A whirlwind one-second vid at 12x; note the recording timers. Once you do choose to edit, there’s not much to think about except how fast you want the elements to move. There are seven choices, and for video shot on a phone, that’s plenty. You can save at 1x, 2x, 4x, 6x, 8x, 10x, or 12x. For Instagram, videos can be up to 15 seconds long and in square format. Unlike the timelapse feature on the iPhone 5S, there’s no way to pick and choose where in the video you want the effect to appear. With Hyperlapse, supercharged timelapse is an all-or-nothing affair. Nor can you import older videos into Hyperlapse to apply any stabilizing effects after the fact. When you’re satisfied with the timelapse portion of the video, then you can pull it into Instagram where you can trim and add a filter for the finishing touch. All saved videos reside in the Camera Roll, which gives you further opportunities to fine tune your edits later. While I don’t much care for Instagram’s imaging filters, with timelapse video, they looked a lot more agreeable and seemed more useful for a cool video effect. But that’s just me. Tap any dot to change the video speed. After that, just post to your account and share with the world on your favorite social networks via Instagram. Sweet! Hyperlapse is a fun video toy and easily facilitates shooting the same old thing with a new look. Like any effect, it’s great for specialized uses, and best not overused. Too bad Android users will have to wait to get their hands on it. 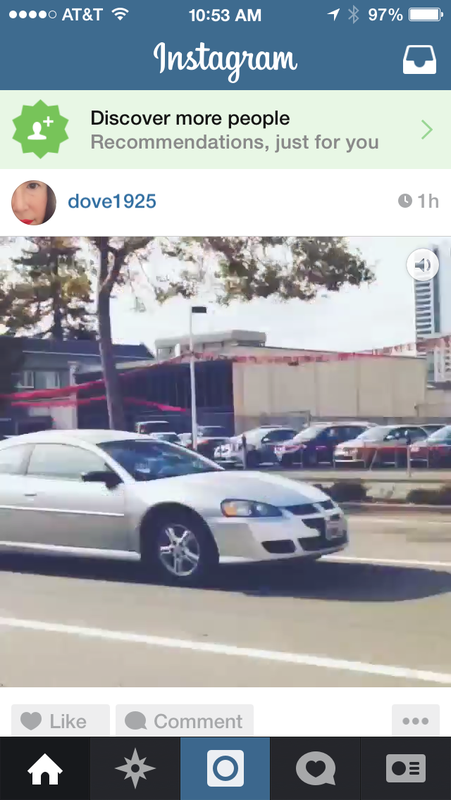 Instagram’s Hyperlapse: a longterm hit or forgotten in a week like Bolt? Read next: Machines are taking control of the world, so why stop them?